Hi Mark - Sorry you are letting the bike go, it looks like a lot of work went into it. I have been pondering a Z1 round rear light on my Z1000A2 project and yours looks really good. Did you need a Z1 tail for it to fit so well or do you think a Z1000 shape would work as well? Envious about the tail tidy look too - commercial product from somewhere or did you make something to suit? Graham-A2 wrote: Hi Mark - Sorry you are letting the bike go, it looks like a lot of work went into it. 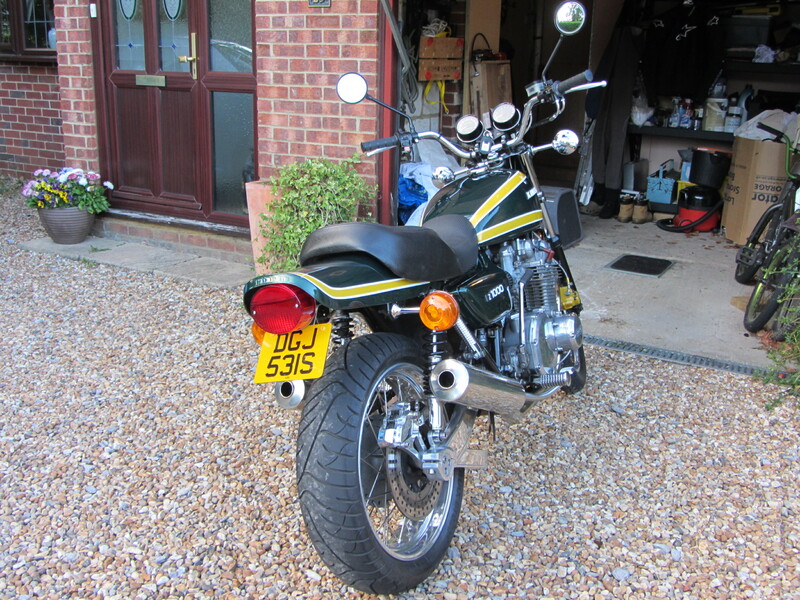 It's a lovely bike, Mark, that's for sure and, interestingly, I was considering going for a Z1 tail on my A2 but stuck with the original but fitted a Z1 light with one of Phil's (Hobbo) tail tidy's -- pic included for Graham's reference. The tail tidy can be fully adjusted to have your light tucked inside the tail. Level (like mine) or exposed plus it can be adjusted height-wise too. They really are very good! one of my 650's has built in indicators/tail light and got through the MOT no problems. Just to round this off, I bought Mark's bike and absolutely love it. It came with loads of spares, new and old and with a lot of history too. I'm on a complete nostalgia kick because my dad bought a Z1A from Ray Round in 1974 GUE440N (I think the price was £1147.00 and it was delivered to you in those days free of charge). He didn't actually ride it but I did as an 18yr old for 12000 miles, before it was sold on. What a privilege. Those days of the superbike, I don't think, were ever repeated. Last edited by guzziman56 on Fri Feb 09, 2018 8:23 am, edited 1 time in total. Well done Roger, You got a nice bike there.